Scott E.L. Frump, 23, was sentenced July 17 on two felony cases that had been continued since May when he appeared in court and said that he was too sick to proceed. Frump had already plead guilty May 1 to possession of heroin, a fifth-degree felony, and failure to appear, a fourth-degree felony. During his scheduled sentencing hearing May 31, the court granted a continuance when Frump said that he had been in the hospital for internal body organ failure. Frump was ordered July 17 to serve one year in prison on the two cases. The Washington C.H. man was reportedly at a family member’s house in the village of Octa Sept. 9, 2016, when he had a drug overdose. A family member called for help. Frump was found on a bed unconscious, foaming at the mouth and with a faint heartbeat, reports said. A Fayette County deputy sheriff administered one dose of Naloxone to reverse the suspected drug overdose before the EMTs arrived, but Frump remained unconscious. The deputy sheriff administered Naloxone again, applied an AED defibrillator and performed CPR. A hypodermic needle and “several small papers with a white residue” were found beside Frump on the bed, along with a heavy metal spoon with burn marks, reports said. The Fayette County EMS transported Frump to the hospital for further treatment. The deputy sheriff submitted a medical records request form to Fayette County Memorial Hospital to obtain Frump’s medical tests to include in the criminal investigation. According to the medical tests received in the case file, Frump’s urine test was positive for opiates and no other drugs. 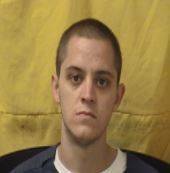 He is currently serving his prison term and is booked at the Correctional Reception Center, Orient, Ohio.